I have found a place where I do not need to answer my cell phone, read emails or feel chained to my computer. Here I can savor the delicious tropical breeze coming off Biscayne Bay. Entering this green hideaway, I am serenely transported to a refuge where I can relax and enjoy its sights, sounds, and fragrances in slow-time. 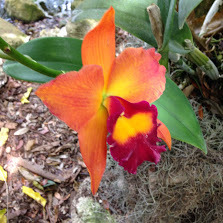 Fairchild Tropical Botanic Garden (FTBG) in Coral Gables Florida. Let me entice you to come here. As I enter the garden path, the rainbow eucalyptus tree catches my eye. Its bark is a riot of red, green, yellow and purple vertical stripes that become more vivid in color after it rains. The path is wide enough for pedestrians, wheelchairs, baby strollers and trams. The path connects the different parts of the 83-acre property. The garden has evolved over time to become one of the most successful botanic gardens in the world. Robert Montgomery purchased the property in 1936, and it opened to the public in 1938. 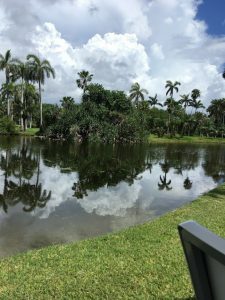 Montgomery named the garden for his friend, David Fairchild, a botanist and plant explorer who collected rare tropical plants for the garden from all over the world. Continuing along the path, the albizia tree rises 50-feet above my head. It is easily the tallest tree in the garden, and its canopy covers hundreds of feet. The baobab tree is next. Its massive base looks similar to the foot of a huge elephant with big toenails. It is famous because a baobab tree befriended the little prince on the tiny planet in Antoine St Exupery’s tale of the same name—Le Petit Prince. In Africa, the baobab circumferences can be so large that the trees can be used for homes or bars for the locals. In addition, the African elephants love them because they have a spongy interior, which retains water that elephants can access when water is scarce. Continuing along the path, I encounter the outdoor native butterfly garden. I grab my camera to capture pictures of the duos, trios, and quartets of local butterflies who are enjoying their favorite blossoms. They land on the blossoms with their black, white, blue and pink markings brilliantly reflecting the dappled sunlight. The rainforest area, home to the Orchid Odyssey, is my next stop. Brilliant dendrobium and phalaenopsis orchids capture my eye at every level and bend in the path. The orchids display the colors of the chakras including red, orange, yellow, green, blue, indigo, violet, and white in shapes and sizes that vary from miniscule to grand. Leaving the Orchid Odyssey, I arrive at the cacao plant—the natural source of chocolate. I promise myself to return to FTBG for the Chocolate Festival in January. Some of the chocolate vendors offer free tastings, and I love that. I pick up the FTBG calendar to learn about other events. 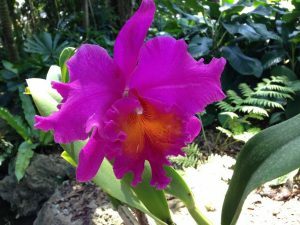 There are frequent festivals described in the calendar including orchid, mango, birds, wildlife, spring garden, and fall garden events scheduled throughout the year. By now my stomach has begun to rumble, so I stop by the Lighthouse Cafe that is attached to the Wings of the Tropics butterfly house. 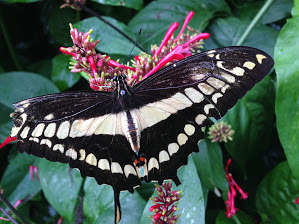 Butterflies from Central America, South America, and Southeast Asia fly freely around the enclosure. Some land on the arms and hats of the guests. While observing the myriad butterflies, I savor a quinoa salad and sip icy cold green tea. The indoor cafe is delightfully air-conditioned so I can cool off while gazing at the butterflies exploring their 25,000-square foot habitat. Upon leaving the café, I notice a petite woman seated just outside the café on a bench. Her legs are crossed, and she is wearing a fedora like hat. 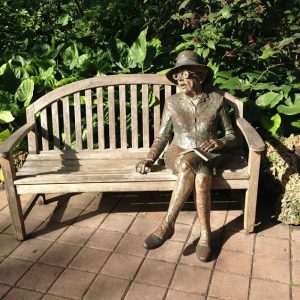 She is a statue of Marjory Stoneman Douglas who wrote, The Everglades: River of Grass, in 1947 and was a staunch advocate for the Everglades and conservation in South Florida. After leaving the café, I head toward the overlook which stretches from the highlands to the lowlands in the distance. The overlook is a popular place for weddings. Couples reserve the location here for years in advance of their big day. Walking towards the auditorium from the overlook, the Cycad Circle is next. The cycads are the oldest plants still living on earth. Their origins dated back 100-million years ago. Their long thin leaves have a prickly underside that deters animals that might enjoy munching on them. From the Cycad Circle, I wander into the palm area. Here there is a covered path leading down to a sunken waterfall. A wooden bench beckons me to sit. A melodious chorus of the waterfall lulls me into a peaceful state. I take a deep breath and enjoy the natural beauty of this hidden place. After leaving the waterfall, I walk slowly back toward the garden entrance before closing time at 4:30. Today, I realize I have discovered a serene refuge from the clamor of everyday life. I resolve to return frequently to delight in its spell. Won’t you join me? For more information visit the FTBG website – https://www.fairchildgarden.org/.